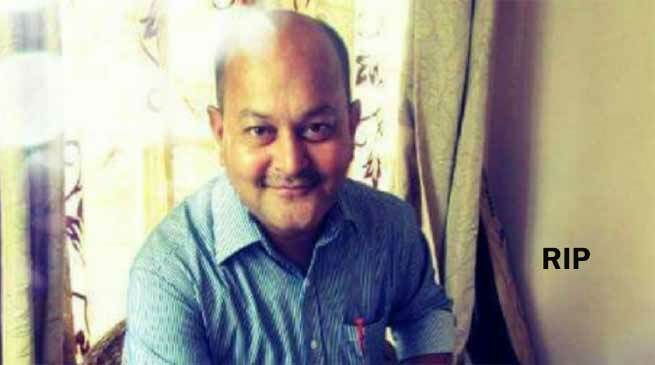 Senior journalist Simanta Bhagawati passed away at the GNRC Hospital on Saturday morning following a massive stroke. He was 53. He leaves behind his wife and a daughter. An avid sportsman, Bhagawati suffered the stroke while playing tennis at the India Club here on April 19. Though he was rushed to hospital, he did not regain consciousness and breathed his last this morning. Born on May 15, 1964, Bhagawati joined The Assam Tribune as a sub editor on June 1, 1989, and was promoted to the rank of chief sub editor on August 1, 2006. He served the newspaper up to May last year. An amiable person with a good sense of humour and a helpful nature, he was loved by all. He was a Sainik School Goalpara passout. The employees of The Assam Tribune held a condolence meeting in the office premises and observed one minute’s silence as a mark of respect for the departed soul. They also expressed their sympathies to Bhagawati’s bereaved family. Chief Minister Sarbananda Sonowal, among others, has mourned Bhagawati’s death. In a message, the Chief Minister said that Bhagawati had made valuable contribution to the field of journalism through his association with The Assam Tribune as well as through various articles which he penned for leading newspapers. As a sportsperson also, his contribution helped the growth of tennis in Assam, Sonowal added. The Chief Minister also offered his sympathies to the bereaved family and prayed for eternal peace of the departed soul. Industry and Commerce Minister Chandra Mohan Patowary too has condoled the demise of Bhagawati. Media Advisor to the Chief Minister Hrishikesh Goswami while condoling Bhagawati’s demise, recalled his contributions as a journalist and sportsperson and termed his death a great loss for both the fields.